Exeter won in France for the first time in six attempts as they beat La Rochelle 36-10 in the Challenge Cup. Gareth Steenson's early penalty was added to by first-half tries from Tom James and Brett Sturgess before Jean-Pascal Barraque pulled a try back. Julien Audy kicked a penalty early in the second half for La Rochelle, but Steenson replied with three of his own. Tries from Byron McGuigan and Fetu'u Vainikolo secured a bonus point late on after Lekso Kaulashvili was sin-binned. 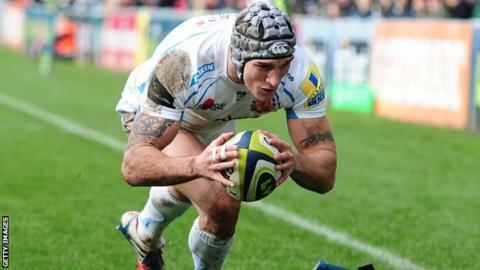 The win puts Exeter six points ahead at the top of Pool Two of the Challenge Cup. Jules Lebail missed an early penalty for La Rochelle before Steenson - who signed a three-year contract extension on Thursday - scored his attempt. Midway through the first half, the Chiefs messed up twice within a minute on the La Rochelle try-line as first Moray Low knocked on as he stretched to go over and then Matt Jess was tackled into touch as he motored towards the right corner. Sturgess then had a try disallowed after Ryan Caldwell knocked the ball forward from the resulting lineout. But the break came five minutes later as McGuigan burst through and ran 50 metres before offloading to Lees, who in turn fed James to go over. However, Exeter were caught napping five minutes before the end as LeBail chipped a perfectly weighted ball into a vacant area behind the Exeter line for Barraque to run on to and score the home side's only try. Audy's penalty early in the second half was the final time La Rochelle troubled their scorers as Steenson kicked three more penalties to pull Exeter clear. The hosts had Kaulashvili yellow-carded with nine minutes left after an infringement in the maul and Exeter took advantage to secure the bonus. McGuigan, who only joined the Chiefs from Glasgow Warriors last month, got his first try a minute later as he got on the end of a long pass from Ian Whitten to go over in the corner. Replacement Vainikolo finished the job off four minutes from time after a wonderful dummy by James. La Rochelle: Barraque; Botia, Alofa, Murimurivalu, Cler; Lebail, Audy; Seneca, Geledan, Bourrust; Grobler, Cedaro; Guyot, Djebaili (capt), Goujon. Replacements: Va Vuuren, Pelo, Kaulashvili, Meron, Qovu, Gourdon, Fortassin, Gard. Exeter Chiefs: McGuigan; Jess, Hughes, Whitten, James; Steenson (capt), Thomas; Sturgess, Cowan-Dickie, Low; Lees, Caldwell; Ewers, White, Horstmann. Replacements: Bateman, Rimmer, Brown, Mumm, Scaysbrook, Lewis, Sweeney, Vainikolo.